Today's world is best described by one word: turbulence. Every leader today knows they need to be nimble, agile and resilient--but how? In this engaging and insightful new book, management strategist and Wharton Fellow Baba Prasad sheds new light on the subject, and offers practical advice for executives, entrepreneurs, and anyone else who'll need the skills to face the unpredictability, risk, and deep uncertainty that lies ahead. It is possible to embrace change and uncertainty without sacrificing innovation and growth. Nimble shows you how. Baba Prasad (Prasad) is a leading thinker in the area of management strategy and leadership. He is President & CEO of Vivékin Group, a management consultancy that focuses on helping leaders and organizations become strategically agile. Prasad has a Ph.D. in Operations & Information Management from the Wharton School, where he has also been a Fellow since 1997. He teaches courses on strategy and innovation at various business schools. Prasad studied computer science and artificial intelligence and robotics at universities in India and the US. He has been a technology strategy consultant on Wall Street, and has served on the faculty in the business schools at Purdue University and the University of Minnesota. Prasad lives across two continents and is a fitness enthusiast. He and his wife, Professor Leela Prasad of Duke University, also work in economically underprivileged schools in Hyderabad, India. They helped to set up “Aksharavani,” a school for children of migrant construction workers, in the city. They are currently making a documentary film titled Moved by Gandhi. “You can't argue with the idea that enterprises of all sorts need to be nimble. The world is changing too fast, too suddenly, and in totally unexpected ways--lumbering momentum is no longer a guarantee of success in this business environment. 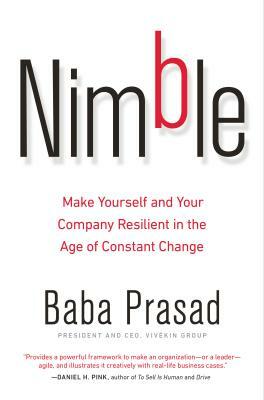 Baba Prasad provides a powerful framework to make an organization--or a leader--agile, and illustrates it creatively with real-life business cases." "The only constant in today's business world is change. In this essential book, Baba Prasad distills how leaders and organizations can embrace the constant pace of change to be more effective and accelerate growth. This book contains a wealth of wisdom for anyone interested in building a better business!" "Taking a radically different approach, this book demonstrates how five intelligences make us indomitable and enterprising, and at the same time, unselfish and giving leaders. Prasad's five intelligences framework helps build companies that are dynamic, resilient and visionary"
"In a volatile, uncertain and increasingly complex world, the ability for companies and individuals to excel at strategic and operational agility is quickly becoming a source of durable competitive advantage. Nimble serves as a guide for understanding the evolution of business practices that enabled success in their respective eras, and introduces a pragmatic framework for how those practices must evolve to compete and win in today's environment. Definitely a 'must read' for leaders of any sized organization or team." "Prasad unearths a fundamental truth posited by Darwin and connects it to business namely that agility and emotional intelligence are as vital to business as they are to human survival. If we want to compete to win in the jungle of business we must gear up as emotionally intelligent and human-centered leaders of dynamic cultures that enable the realization of a strategically agile business model. This is a powerful articulation of a new axiom that will define business strategy in the decades to come." "The one thing you need to understand to win in business today? Nimble. Do it, be it, and strive for it. Baba Prasad's latest book will show you how." "Baba Prasad drives the point that just having smart people is not enough for companies' success; rather a company culture that enables people to apply different intelligences will make them into agile entrepreneurs and empowered change agents and give greater success to the company over competitors. Very true indeed." "In a world where turmoil is the only constant, Nimble charts a bold new path for leadership, strategy and innovation. This is a mindset-changing book for executives and students of business." "Baba Prasad's breaking up of strategic agility into 5 distinct components that are applicable to both strategic development and execution will make this an extremely useful tool for strategy practitioners. Visionary agility needs to go hand in hand with operational agility."